The atmosphere of Titan is the layer of gases surrounding Titan, the largest moon of Saturn. It is the only thick atmosphere of a natural satellite in the Solar System. The presence of a significant atmosphere was first suspected by Spanish astronomer Josep Comas i Solà, who observed distinct limb darkening on Titan in 1903, and confirmed by Gerard P. Kuiper in 1944 using a spectroscopic technique that yielded an estimate of an atmospheric partial pressure of methane of the order of 100 millibars (10 kPa). Subsequent observations in the 1970s showed that Kuiper's figures had been significant underestimates; methane abundances in Titan's atmosphere were ten times higher, and the surface pressure was at least double what he had predicted. The high surface pressure meant that methane could only form a small fraction of Titan's atmosphere. In 1980, Voyager 1 made the first detailed observations of Titan's atmosphere, revealing that its surface pressure was higher than Earth's, at 1.5 bars (about x1.48 of Earth's atmosphere). On June 23, 2014, a NASA/ESA said its isotopic abundances were evidence that the nitrogen in the atmosphere of Titan came from materials in the Oort cloud, associated with comets, and not from the materials that formed Saturn in earlier times. Observations from the Voyager space probes have shown that the Titanean atmosphere is denser than Earth's, with a surface pressure about 1.45 times that of Earth's. Titan's atmosphere is about 1.19 times as massive as Earth's overall, or about 7.3 times more massive on a per surface area basis. It supports opaque haze layers that block most visible light from the Sun and other sources and renders Titan's surface features obscure. The atmosphere is so thick and the gravity so low that humans could fly through it by flapping "wings" attached to their arms. Titan's lower gravity means that its atmosphere is far more extended than Earth's; even at a distance of 975 km, the Cassini spacecraft had to make adjustments to maintain a stable orbit against atmospheric drag. 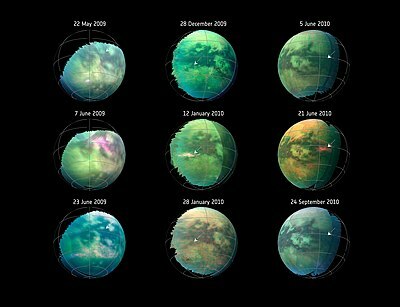 The atmosphere of Titan is opaque at many wavelengths and a complete reflectance spectrum of the surface is impossible to acquire from the outside. It was not until the arrival of Cassini–Huygens in 2004 that the first direct images of Titan's surface were obtained. The Huygens probe was unable to detect the direction of the Sun during its descent, and although it was able to take images from the surface, the Huygens team likened the process to "taking pictures of an asphalt parking lot at dusk". A cloud imaged in false color over Titan's north pole. The atmospheric composition in the stratosphere is 98.4% nitrogen—the only dense, nitrogen-rich atmosphere in the Solar System aside from Earth's—with the remaining 1.6% composed mostly of methane (1.4%) and hydrogen (0.1–0.2%). Because methane condenses out of Titan's atmosphere at high altitudes, its abundance increases as one descends below the tropopause at an altitude of 32 km, leveling off at a value of 4.9% between 8 km and the surface. There are trace amounts of other hydrocarbons, such as ethane, diacetylene, methylacetylene, acetylene and propane, and of other gases, such as cyanoacetylene, hydrogen cyanide, carbon dioxide, carbon monoxide, cyanogen, argon and helium. The orange color as seen from space must be produced by other more complex chemicals in small quantities, possibly tholins, tar-like organic precipitates. The hydrocarbons are thought to form in Titan's upper atmosphere in reactions resulting from the breakup of methane by the Sun's ultraviolet light, producing a thick orange smog. Titan has no magnetic field, although studies in 2008 showed that Titan retains remnants of Saturn's magnetic field on the brief occasions when it passes outside Saturn's magnetosphere and is directly exposed to the solar wind. This may ionize and carry away some molecules from the top of the atmosphere. In November 2007, scientists uncovered evidence of negative ions with roughly 13 800 times the mass of hydrogen in Titan's ionosphere, which are thought to fall into the lower regions to form the orange haze which obscures Titan's surface. The smaller negative ions have been identified as linear carbon chain anions with larger molecules displaying evidence of more complex structures, possibly derived from benzene. These negative ions appear to play a key role in the formation of more complex molecules, which are thought to be tholins, and may form the basis for polycyclic aromatic hydrocarbons, cyanopolyynes and their derivatives. Remarkably, negative ions such as these have previously been shown to enhance the production of larger organic molecules in molecular clouds beyond our Solar System, a similarity which highlights the possible wider relevance of Titan's negative ions. Energy from the Sun should have converted all traces of methane in Titan's atmosphere into more complex hydrocarbons within 50 million years — a short time compared to the age of the Solar System. This suggests that methane must be somehow replenished by a reservoir on or within Titan itself. That Titan's atmosphere contains over a thousand times more methane than carbon monoxide would appear to rule out significant contributions from cometary impacts, because comets are composed of more carbon monoxide than methane. That Titan might have accreted an atmosphere from the early Saturnian nebula at the time of formation also seems unlikely; in such a case, it ought to have atmospheric abundances similar to the solar nebula, including hydrogen and neon. Many astronomers have suggested that the ultimate origin for the methane in Titan's atmosphere is from within Titan itself, released via eruptions from cryovolcanoes. A possible biological origin for the methane has not been discounted (see Life on Titan). Titan's ionosphere is also more complex than Earth's, with the main ionosphere at an altitude of 1,200 km but with an additional layer of charged particles at 63 km. This splits Titan's atmosphere to some extent into two separate radio-resonating chambers. The source of natural extremely-low-frequency (ELF) waves on Titan, as detected by Cassini–Huygens, is unclear as there does not appear to be extensive lightning activity. Titan's internal magnetic field is negligible, and perhaps even nonexistent. Its orbital distance of 20.3 Saturn radii does place it within Saturn's magnetosphere occasionally. However, the difference between Saturn's rotational period (10.7 hours) and Titan's orbital period (15.95 days) causes a relative speed of about 7005100000000000000♠100 km/s between the Saturn's magnetized plasma and Titan. That can actually intensify reactions causing atmospheric loss, instead of guarding the atmosphere from the solar wind. On September 30, 2013, propylene was detected in the atmosphere of Titan by NASA's Cassini spacecraft, using its composite infrared spectrometer (CIRS). The persistence of a dense atmosphere on Titan has been enigmatic as the atmospheres of the structurally similar satellites of Jupiter, Ganymede and Callisto, are negligible. Although the disparity is still poorly understood, data from recent missions have provided basic constraints on the evolution of Titan's atmosphere. Titan's atmosphere backlit by the Sun, with Saturn's rings behind. An outer haze layer merges at top with the northern polar hood. Tentative constraints are available, with the current loss mostly due to low gravity and solar wind aided by photolysis. The loss of Titan's early atmosphere can be estimated with the 14N–15N isotopic ratio, because the lighter 14N is preferentially lost from the upper atmosphere under photolysis and heating. Because Titan's original 14N–15N ratio is poorly constrained, the early atmosphere may have had more N2 by factors ranging from 1.5 to 100 with certainty only in the lower factor. Because N2 is the primary component (98%) of Titan's atmosphere, the isotopic ratio suggests that much of the atmosphere has been lost over geologic time. Nevertheless, atmospheric pressure on its surface remains nearly 1.5 times that of Earth as it began with a proportionally greater volatile budget than Earth or Mars. It is possible that most of the atmospheric loss was within 50 million years of accretion, from a highly energetic escape of light atoms carrying away a large portion of the atmosphere (hydrodynamic blow off event). Such an event could be driven by heating and photolysis effects of the early Sun's higher output of X-ray and ultraviolet (XUV) photons. Because Callisto and Ganymede are structurally similar to Titan, it is unclear why their atmospheres are insignificant relative to Titan's. Nevertheless, the origin of Titan's N2 via geologically ancient photolysis of accreted and degassed NH3, as opposed to degassing of N2 from accretionary clathrates, may be the key to a correct inference. Had N2 been released from clathrates, 36Ar and 38Ar that are inert primordial isotopes of the Solar System should also be present in the atmosphere, but neither has been detected in significant quantities. The insignificant concentration of 36Ar and 38Ar also indicates that the ~40 K temperature required to trap them and N2 in clathrates did not exist in the Saturnian subnebula. Instead, the temperature may have been higher than 75 K, limiting even the accumulation of NH3 as hydrates. Temperatures would have been even higher in the Jovian subnebula due to the greater gravitational potential energy release, mass, and proximity to the Sun, greatly reducing the NH3 inventory accreted by Callisto and Ganymede. The resulting N2 atmospheres may have been too thin to survive the atmospheric erosion effects that Titan has withstood. ^ Dyches, Preston; Clavin, Clavin (June 23, 2014). "Titan's Building Blocks Might Pre-date Saturn". NASA. Retrieved June 24, 2014. ^ Coustenis, Athéna & Taylor, F. W. (2008). Titan: Exploring an Earthlike World. World Scientific. p. 130. ISBN 978-981-270-501-3. Retrieved 2010-03-25. ^ Turtle, Elizabeth P. (2007). "Exploring the Surface of Titan with Cassini–Huygens". Smithsonian. Retrieved 2009-04-18. ^ Schröder, S. E.; Tomasko, M. G.; Keller, H. U. (August 2005). "The reflectance spectrum of Titan's surface as determined by Huygens". American Astronomical Society, DPS meeting #37, #46.15; Bulletin of the American Astronomical Society. 37 (726): 726. Bibcode:2005DPS....37.4615S. ^ de Selding, Petre (January 21, 2005). "Huygens Probe Sheds New Light on Titan". SPACE.com. Archived from the original on 4 April 2005. Retrieved 2005-03-28. ^ Baez, John (January 25, 2005). "This Week's Finds in Mathematical Physics". University of California, Riverside. Archived from the original on 2012-02-08. Retrieved 2007-08-22. ^ Waite, J. H.; et al. (2007). "The Process of Tholin Formation in Titan's Upper Atmosphere". Science. 316 (5826): 870–5. Bibcode:2007Sci...316..870W. doi:10.1126/science.1139727. PMID 17495166. ^ "Saturn's Magnetic Personality Rubs Off on Titan". NASA/JPL. 2008. Archived from the original on 20 May 2009. Retrieved 2009-04-20. ^ Coates, A. J.; F. J. Crary; G. R. Lewis; D. T. Young; J. H. Waite & E. C. Sittler (2007). "Discovery of heavy negative ions in Titan's ionosphere". Geophys. Res. Lett. 34 (22): L22103. Bibcode:2007GeoRL..3422103C. doi:10.1029/2007GL030978. ^ Desai, R. T.; A. J. Coates; A. Wellbrock; V. Vuitton; D. González-Caniulef; et al. (2017). "Carbon Chain Anions and the Growth of Complex Organic Molecules in Titan's Ionosphere". Astrophys. J. Lett. 844: L18. arXiv:1706.01610. Bibcode:2017ApJ...844L..18D. doi:10.3847/2041-8213/aa7851. ^ Walsch, C.; N. Harada; E. Herbst & T. J. Millar (2017). "The EFFECTS OF MOLECULAR ANIONS ON THE CHEMISTRY OF DARK CLOUDS". Astrophys. J. 700: 752–761. arXiv:0905.0800. Bibcode:2009ApJ...700..752W. doi:10.3847/2041-8213/aa7851. ^ "Has Cassini found a universal driver for prebiotic chemistry at Titan?". European Space Agency. July 26, 2017. Retrieved 2017-08-12. ^ Stofan, E. R.; et al. (2007). "The lakes of Titan". Nature. 445 (7123): 61–4. Bibcode:2007Natur.445...61S. doi:10.1038/nature05438. PMID 17203056. ^ Tobie, Gabriel; Lunine, Jonathan & Sotin, Cristophe (2006). "Episodic outgassing as the origin of atmospheric methane on Titan". Nature. 440 (7080): 61–64. Bibcode:2006Natur.440...61T. doi:10.1038/nature04497. PMID 16511489. ^ "Wind or Rain or Cold of Titan's Night?". Astrobiology Magazine. March 11, 2005. Archived from the original on 27 September 2007. Retrieved 2007-08-24. ^ a b H. Backes; et al. (2005). "Titan's magnetic field signature during the first Cassini encounter". Science. 308 (5724): 992–995. Bibcode:2005Sci...308..992B. doi:10.1126/science.1109763. PMID 15890875. ^ D.G. Mitchell; et al. (2005). "Energetic neutral atom emissions from Titan interaction with Saturn's magnetosphere". Science. 308 (5724): 989–992. Bibcode:2005Sci...308..989M. doi:10.1126/science.1109805. PMID 15890874. ^ Staff (April 3, 2013). "NASA team investigates complex chemistry at Titan". Phys.Org. Retrieved April 11, 2013. ^ Jpl.Nasa.Gov (2013-09-30). "NASA's Cassini Spacecraft Finds Ingredient of Household Plastic in Space - NASA Jet Propulsion Laboratory". Jpl.nasa.gov. Retrieved 2013-10-04. ^ Dyches, Preston; Zubritsky, Elizabeth (October 24, 2014). "NASA Finds Methane Ice Cloud in Titan's Stratosphere". NASA. Retrieved October 31, 2014. ^ Zubritsky, Elizabeth; Dyches, Preston (October 24, 2014). "NASA Identifies Ice Cloud Above Cruising Altitude on Titan". NASA. Retrieved October 31, 2014. ^ P.A. Bland; et al. (2005). "Trace element carrier phases in primitive chondrite matrix: implications for volatile element fractionation in the inner solar system" (PDF). Lunar and Planetary Science. XXXVI: 1841. ^ F.M. Flasar; et al. (2005). "Titan's atmospheric temperatures, winds, and composition". Science. 308 (5724): 975–978. Bibcode:2005Sci...308..975F. doi:10.1126/science.1111150. PMID 15894528. ^ a b G. Lindal; et al. (1983). "The atmosphere of Titan: An analysis of the Voyager 1 radio occultation measurements". Icarus. 53 (2): 348–363. Bibcode:1983Icar...53..348L. doi:10.1016/0019-1035(83)90155-0. ^ G. Tobie; J.I. Lunine; C. Sotin (2006). "Episodic outgassing as the origin of atmospheric methane on Titan". Nature. 440 (7080): 61–64. Bibcode:2006Natur.440...61T. doi:10.1038/nature04497. PMID 16511489. ^ a b J.H. Waite (Jr); et al. (2005). "Ion neutral mass spectrometer results from the first flyby of Titan". Science. 308 (5724): 982–986. Bibcode:2005Sci...308..982W. doi:10.1126/science.1110652. PMID 15890873. ^ a b T. Penz; H. Lammer; Yu.N. Kulikov; H.K. Biernat (2005). "The influence of the solar particle and radiation environment on Titan's atmosphere evolution". Advances in Space Research. 36 (2): 241–250. Bibcode:2005AdSpR..36..241P. doi:10.1016/j.asr.2005.03.043. ^ a b A. Coustenis (2005). "Formation and Evolution of Titan's Atmosphere". Space Science Reviews. 116 (1–2): 171–184. Bibcode:2005SSRv..116..171C. doi:10.1007/s11214-005-1954-2. ^ a b H.B. Niemann; et al. (2005). "The abundances of constituents of Titan's atmosphere from the GCMS instrument on the Huygens probe". Nature. 438 (7069): 779–784. Bibcode:2005Natur.438..779N. doi:10.1038/nature04122. PMID 16319830. ^ a b T.C. Owen; H. Niemann; S. Atreya; M.Y. Zolotov (2006). "Between heaven and Earth: the exploration of Titan". Faraday Discussions. 133: 387–391. Bibcode:2006FaDi..133..387O. CiteSeerX 10.1.1.610.9932. doi:10.1039/b517174a. PMID 17191458. ^ McCartney, Gretchen; Brown, Dwayne; Wendel, JoAnna; Bauer, Markus (24 September 2018). "Dust Storms on Titan Spotted for the First Time". NASA. Retrieved 24 September 2018. Roe, H. G. (2012). "Titan's Methane Weather". Annual Review of Earth and Planetary Sciences. 40: 355–382. Bibcode:2012AREPS..40..355R. doi:10.1146/annurev-earth-040809-152548.